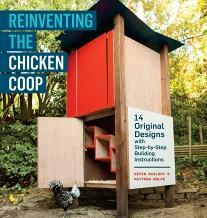 Backyard chickens meet contemporary design! Matthew Wolpe and Kevin McElroy give you 14 complete building plans for chicken coops that range from the purely functional to the outrageously fabulous. One has a water-capturing roof; one is a great homage to mid-Modern architecture; and another has a built-in composting system. Some designs are suitable for beginning builders, and some are challenging enough for experts. Step-by-step building plans are accompanied by full-color photographs and detailed construction illustrations. Soft cover 191 pages.